The science team being briefed about the rotor assembly. In our previous post, we discussed our progress with deciding on a theoretically sound signal chain. Before we cain finally achieve first light on this project, there is one more major electronics issue that needs to be tackled. This problem, although far less important than actually getting signal from the feed horn, could be far more convoluted. We need to be able to wire up the electronics that control the rotor assembly that points the dish. 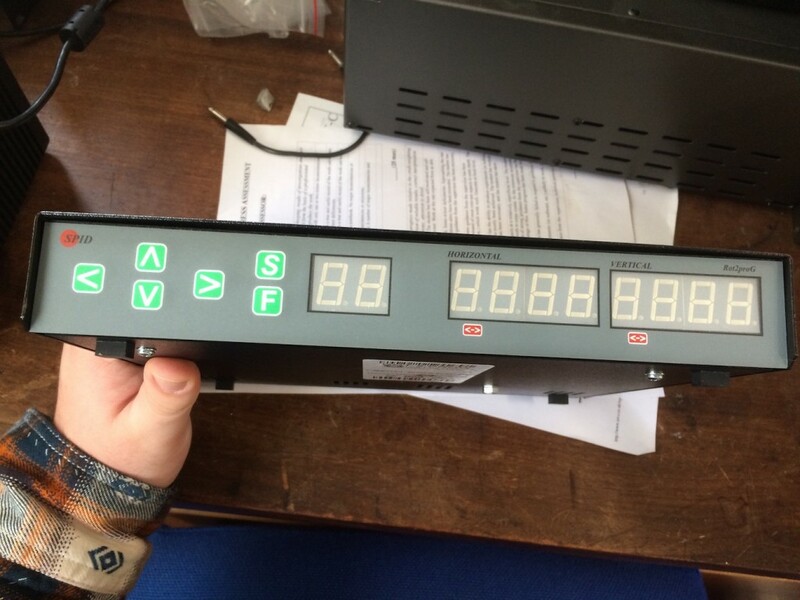 The SPID Elektronik Rot2 Prog is the controller for our rotor. A power supply gives the appropriate power, then this routes the necessary power to the rotor along the appropriate axis to move the dish. The rotor itself is mounted to the top of a pole and can rotate around an axis vertical along the length of the pole. This is the azimuthal angle. The mounting plate is mounted through the rotor which affords it a second degree of freedom in the altitude direction. This allows the dish two degrees of freedom with which it can access the entire sky. In reality, this is limited by both the structure of the dish and pole and surrounding landscape. This kind of antenna mount is known as an AltAz mount, referring to the angles in which it can move. The rotor we’re using is the BIG-RAS, with the mounting for the dish being the accompanying bracket. We are planning to control this rotor with the SPID Elektronik ROT2, which is shown in the picture above. This stage of the project is vital to complete correctly, as a good signal chain is of very little worth if we are unable to accurately point the telescope. 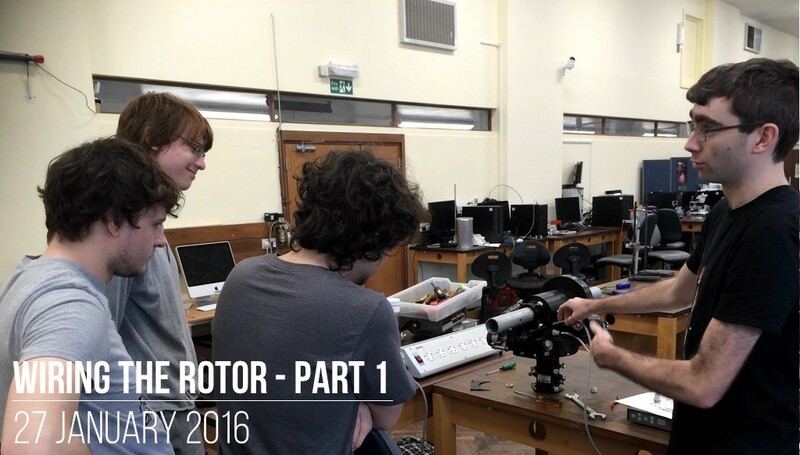 In order to plan the setup, the science team met in the lab at the University of Exeter on 27th January 2016 to study the motor. After multiple attempts to find the (almost hidden) plate referenced in the instructions, we finally managed to hunt down the part to be removed. It was then just a simple case of unscrewing and carefully removing it in order to access the rotor electronics that were safely stowed inside. This shows the internal electronics of the rotor assembly. We can see the wiring blocks for both motors. The wires to them are fed through holes (visible on the right) in the side of the casing. When the protective cover was removed, we were able to see a pair of wiring blocks, each corresponding to a motor drive on the assembly. It’s now our job to construct and test the chain of electronics that will provide power to these motors and control their movement. Over the next few posts we’ll document this process. 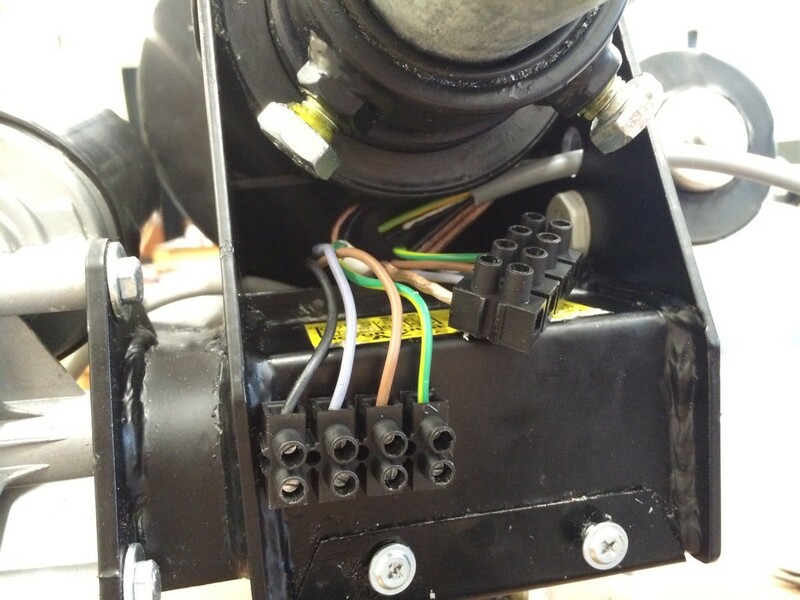 In part 2 we’ll discuss the wiring setup and the feed to the motor.